One of the many pleasures of moving to an entirely new part of the country is learning about the history and culture of the region. This past weekend we visited the Knoxville Museum of Art. Among the highlights in the Museum’s ongoing exhibit, “Higher Ground: A Century of the Visual Arts in East Tennessee,” are several Impressionist paintings by the greatly undersung artist, Anna Catherine Wiley. Wiley (1879—1958), was born into a wealthy and intellectual family at Coal Creek (now Lake City), Tennessee, where her father owned and operated two coal mines. 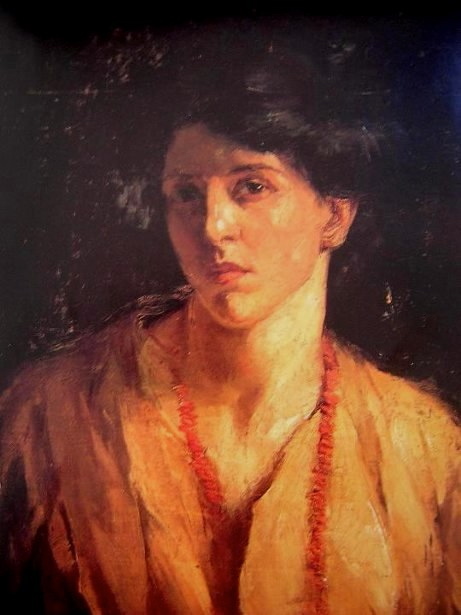 She grew up in Knoxville, studied at the University of Tennessee from 1895—1897, attended the Art Students League in New York from 1903—1905, and spent six months studying with William Merritt Chase before returning to Knoxville in 1905, where she taught art at the University of Tennessee from 1905—1918. 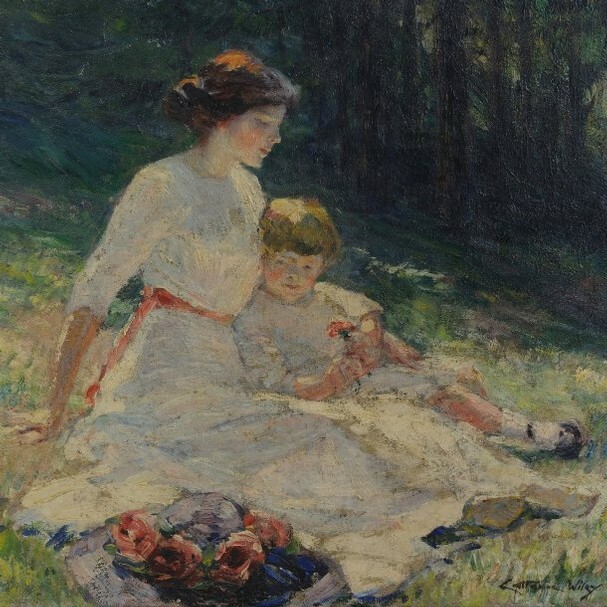 She continued her art instruction under the Knoxville painter, Lloyd Branson, became an influential member of the local art community, and organized a successful exhibition for the Appalachian Exposition of 1910. She spent several summers painting in Massachusetts and Newport, Rhode Island. 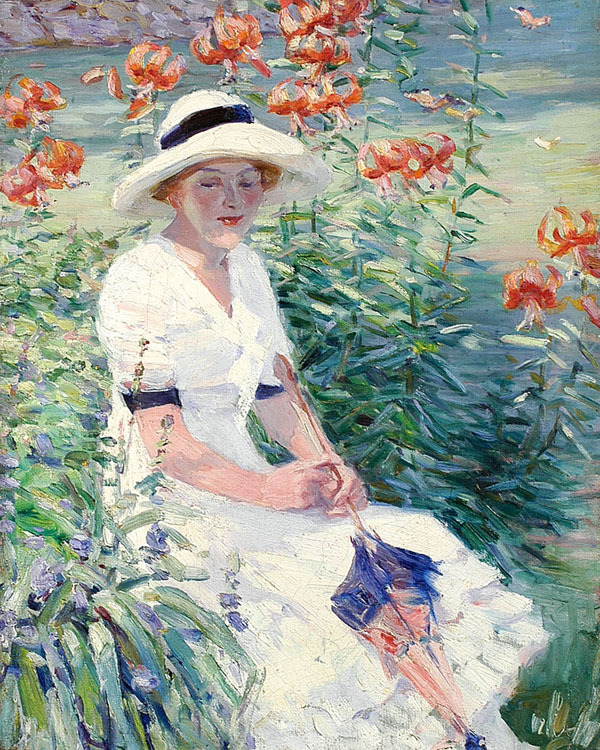 Wiley is best known for her masterful brushwork and exuberant play of natural light in her Impressionist paintings. Typical subject matter included women and children of the upper class in quiet scenes, often painted out of doors where Wiley took maximum advantage of natural, dappled light. 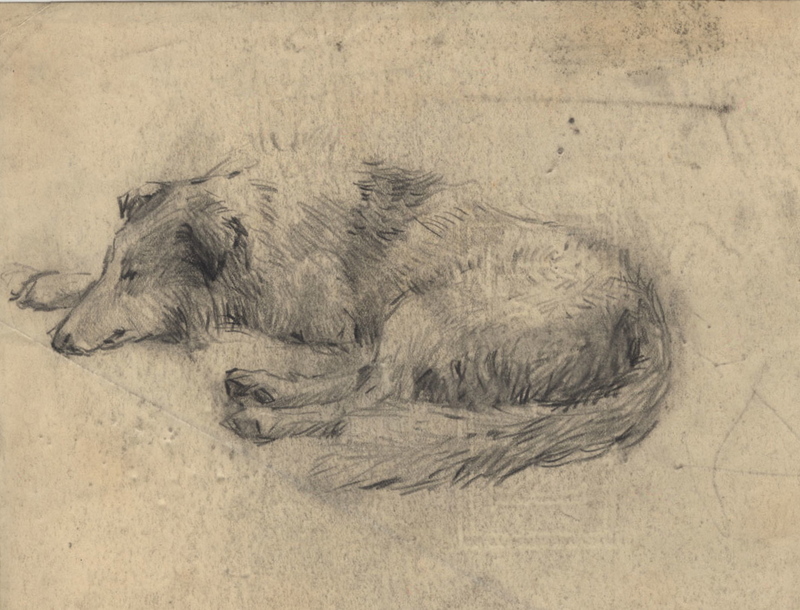 She won numerous regional awards, and her work was shown at the National Academy of Design and the Pennsylvania Academy of the Fine Arts, but she did not achieve the level of national acclaim she desired during her lifetime. Her work, The Lily Pond, is in the collection of the Metropolitan Museum of Art, but most of her work remains in regional museums and private collections. Wiley never married and was close to both her parents. It has been suggested that she suffered from bipolar disorder. The deaths of her father in 1919, her mentor (and possible lover) Lloyd Branson in 1925, and her mother in 1926, were also factors that probably contributed to a serious emotional decline that culminated in a mental breakdown in 1926. Sadly, her siblings committed her to an institution in Philadelphia, where she spent the remaining 32 years of her life. She had no access to art supplies and never painted again. When she died in 1958, her body was returned to Knoxville. Anna Catherine Wiley is buried in Knoxville’s Old Gray Cemetery, not far from her childhood home and the art museum that now features several examples of her lustrous and appealing work. Steve and I are extremely fond of vernacular visionary architecture and folk-art environments. We’ve been known to take some fairly extreme detours to visit these fascinating places, and we’ve experienced the delight of stumbling across others unexpectedly in our travels. The artists who create these site-specific constructions are typically self-taught, eccentric individuals who are driven to follow their personal visions, and labor extensively and steadfastly over long periods of time to create a single great work of monumental scale. Whether created as private sanctuaries for solitary reflection or to make public statements for intended audiences, these works often give expression to powerful underlying philosophical, religious, or political views. Created with improvised construction methods and readily available materials, they are often inherently fragile. They are forced to withstand weather extremes, often face misunderstanding and ridicule from unsympathetic neighbors, and are vulnerable to acts of vandalism. Upkeep can be costly, time consuming, and challenging, and in all too many cases, they are destroyed following the artist’s death. 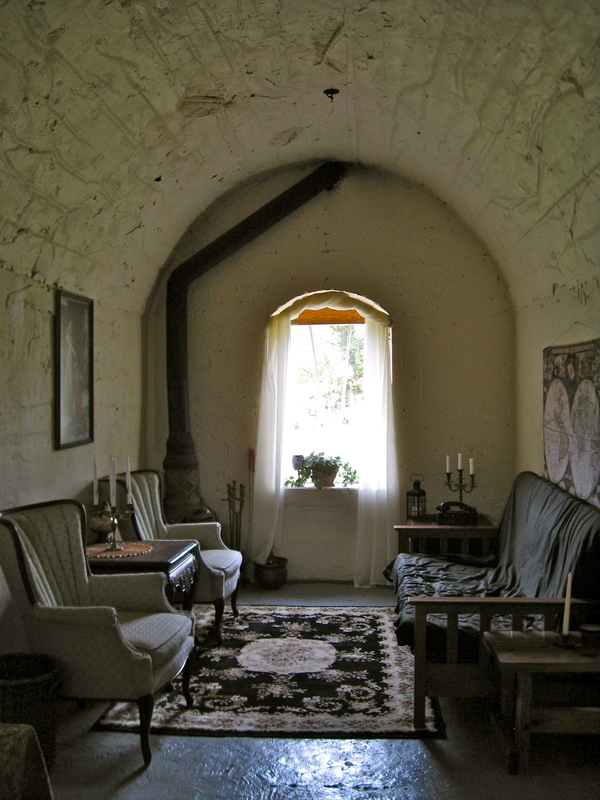 We were intrigued to learn about a structure in nearby Alcoa, Tennessee, known locally as the Old Stone House or Millennium Manor, so naturally, we decided to check it out. 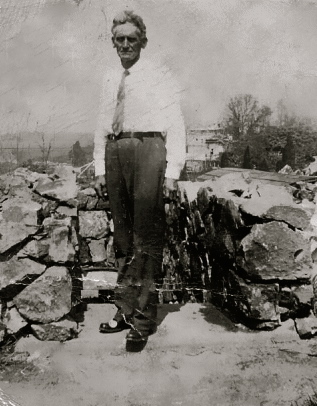 William Andrew Nicholson, a mason and carpenter from Pickens County, Georgia, constructed the Old Stone House along with his wife, Fair, the mother of his ten children. Nicholson had come to Alcoa in 1937 during a worker’s strike at the aluminum smelting plant, as a “replacement for striking workers”—more commonly referred to as “scab labor.” (By the time the strike was over, 28 people had been wounded and 2 killed in a violent clash between striking workers and the company’s police force, and the National Guard was called in to restore order.) 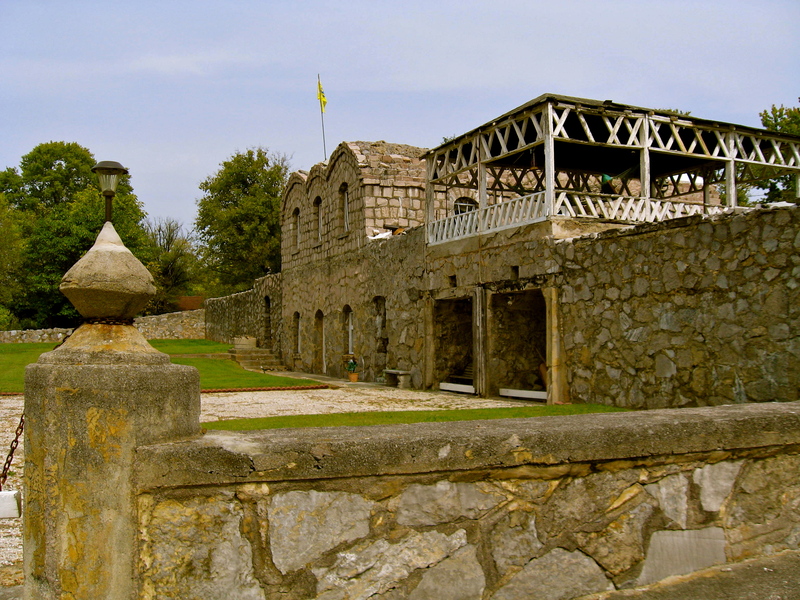 Following the strike Nicholson stayed on at Alcoa, and the following year he purchased a lot overlooking the plant and began building the house. He was 61 years old when he began his great project. Nicholson’s goal was to build the house to last. Specifically, he wanted it to survive Armageddon and a thousand years beyond. He took a literalist view of the Bible, and was inspired by Revelations 20:6, “Blessed and holy is he that hath part in the first resurrection. Over such the second death has no power, but they shall be priests of God and Christ, and shall reign with Him a thousand years.” Nicholson had somehow calculated that the Apocalypse would take place in 1959; when that year came and went uneventfully, he revised his calculation to 1969. He believed that he would be one of 144,000 righteous people to survive and live for a thousand years. To that end, Nicholson built the house with materials that would not corrode or decay—no nails or wood were used with the exception of window and door frames. The house is constructed primarily of local granite and Tennessee pink marble quarried at nearby Friendsville, and more than 4,000 bags of cement. There are 14 rooms and a 2-car underground garage, for a total of about 3,000 square feet under a 3-foot thick roof said to weigh more than 400 tons. The walls vary from 19 inches to 25 inches thick, and the floor is more than 4 feet thick. 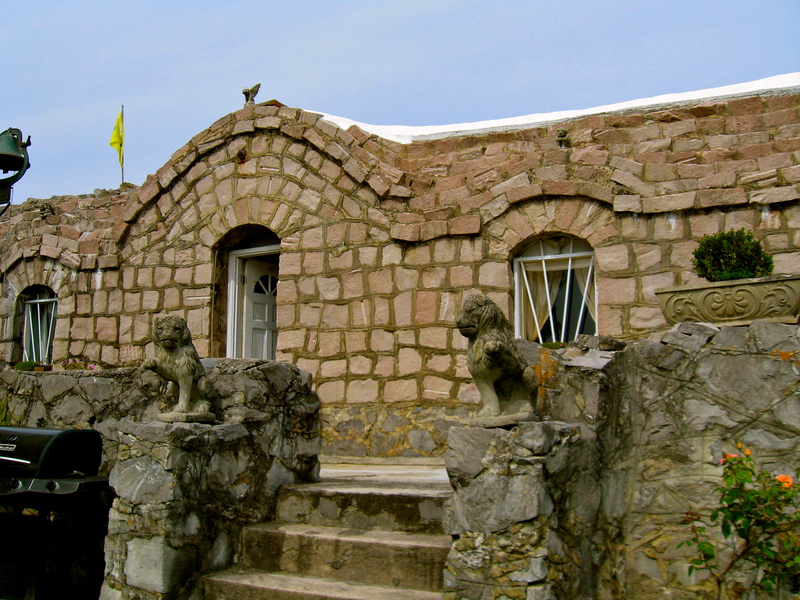 The entire lot is enclosed within a rock wall. Working without formal plans, Nicholson used the stone arch technology developed by the ancient Romans some two thousand years ago. Nicholson first created wood forms. Upstairs, to make smoother interior walls, he placed rubber tarps over the wood. After stacking the stone on the forms, he set the center keystone to keep the rocks steady. He poured cement over the stones to fill cracks and hold the rocks in place, and then removed the wood form and tarp. William and Fair hauled all the rock themselves, some weighing up to 300 pounds each, on their flatbed truck. Fair mixed the cement for the mortar. They toiled together on their project over a period of 9 years, working from 6 to 8 hours per day after William had put in a full shift at the plant. Fair died in 1950, and the grieving William followed her in 1965, four years before the predicted Millennium. The house stood abandoned for a number of years, was briefly used as an Odd Fellows lodge, and was run as a Halloween haunted house by the local Jaycees before falling into disrepair. It became a drinking place for local teenagers, was ravaged by vandalism, used as a trash dump, and encased in a jungle of vines until, facing demolition, it was rescued in 1995 by its current owner, Knoxville fire captain and paramedic, Dean Fontaine. He has been working for 17 years to restore the house. He took time out to give us an impromptu tour of his home yesterday afternoon. Of course, no architectural oddity would be complete without tales of hauntings, and it is said that you can still see candlelight through the windows and hear Mr. Nicholson working on the house at all hours.